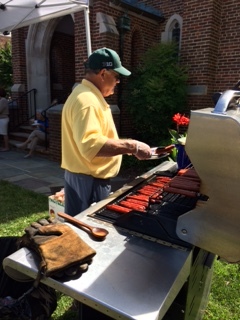 I would like to take a minute to thank all the Brothers that helped or sent their siblings to man the Dogs for Dads event Sunday 6/19/16 in honor of Father’s Day. It was greatly appreciated. 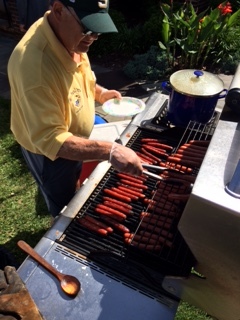 We served approximately 400+ folks. I do want to give a special major thank you to Dale Matanic. Without all his guidance and help, this event would have been a disaster. He was the epitome of calm, cool, and never rattled. He showed this rookie Knight a thing or two about putting on an event. Also a big thanks to Khal who provided with a smile any and every thing we needed. The cooperation was fantastic. It was a lot of fun and enjoyed by all. 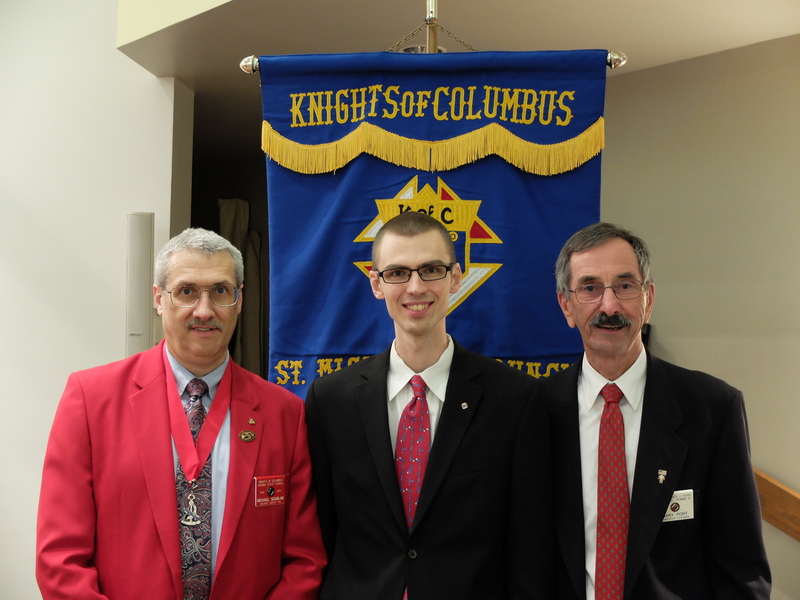 Congratulations to our St. Bridget Assistant Organist.. William Buckley who recently joined our Knights of Columbus Council 5476 and exemplified to the First Degree of the Order. 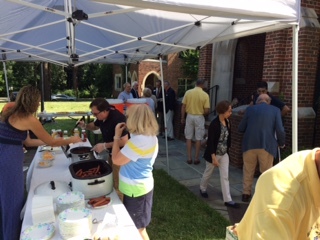 The Knights of Columbus encourages good Catholic men to join our ranks dedicated to serve our clergy, our church, our community and those in need. Please extend your congratulations to our new worthy Knight William Buckley! Pictured (in order) District Deputy Mike Szablak, William Buckley and Council Membership Director Gary Port. The St. Bridget Knights of Columbus Council 5476 .. is pleased to announce their two $1,000 Catholic High School Scholarship Award Winners for 2016. Kathleen Firment and Sarah Hess both young ladies will be attending St. Gertrude High School. Please extend your congratulations to these worthy students where their spiritual growth journey, at a Catholic High School, will continue to be developed and nurtured. 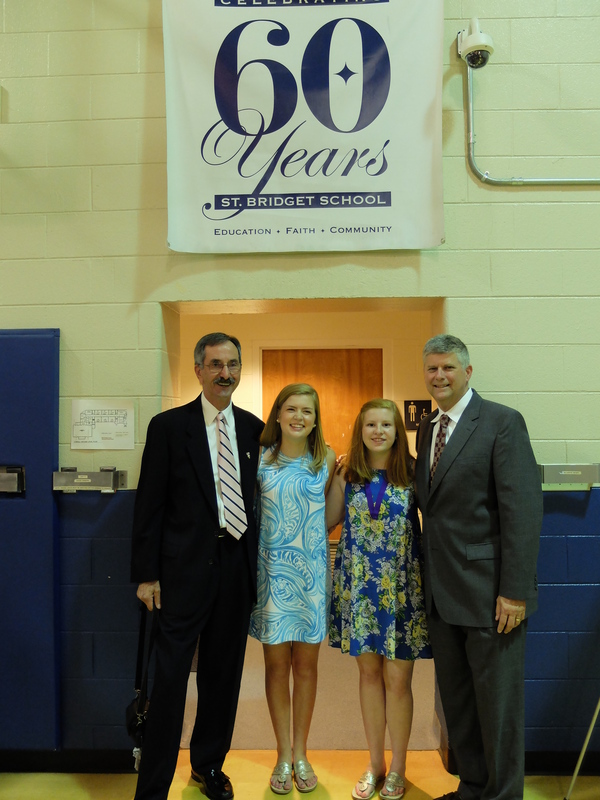 Pictured at a reception after the St Bridget School Eighth Grade Closing Exercises on June 6, 2016 are: Scholarship Chairman Gary Port, Kathleen Firment, Sarah Hess and St. Bridget School Principal George Sadler. our Scholarship Committee reviewed the seven applications received and recommended Kathleen Firment and Sarah Hess as winners to receive our $1,000 Catholic High School Scholarship Awards. They both will be attending St Gertrude High School this fall. Both scholarship winners graduated with 40 other students from St Bridget School on June 6th. Vice Principal George Sadler presented many awards to the students including our award certificates to Kathleen and Sarah. Principal George and I were on hand at the graduation reception to congratulate our winners and take a photo for our church Bulletin. Please extend your congratulations to these worthy Catholic students and their parents. There were no Benedictine College Prep bound graduates that applied for our scholarship award. Five St. Bridget Brothers ready to advance. So far, Membership Director Gary will be one of the Observers/Sponsors for our council candidates. Other council members are encouraged to observe. 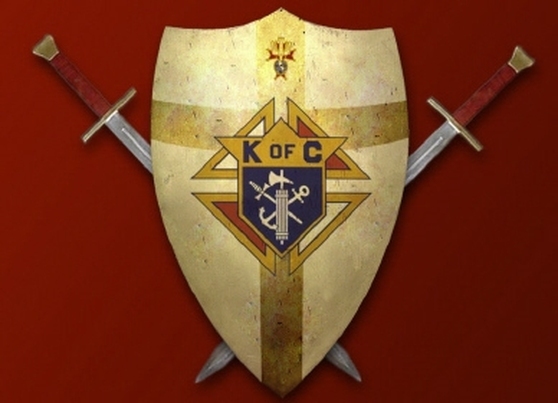 Deputy Grand Knight Rick Witty and Chancellor Ron Coombs will be out of town and unable to attend. Please note the timing and logistics for the 2nd & 3rd Degrees below. Advancement Candidates please call me with any questions.